How can Apple improve on Mac OS X 10.7 Lion? 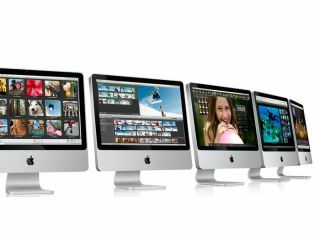 UPDATE: Apple has announced Mac OS X 10.8 Mountain Lion. Now OS X Lion has been out for an entire month, it's time to start mulling over what we'd like to see in its successor. If we miss anything, let us know in the comments. Maybe Apple's designers were watching a lot of classic movies when working on OS X Lion, because it's very grey. Toolbar icons, sidebar icons, windows, scrollbars… all grey. Stylish? Perhaps. A step back in usability for anyone who uses colours as a helpful cue to navigate? Definitely. There's some speech recognition built into OS X Lion, but take it further. Make a Mac a bit like HAL, only less psychotic. If you could just jabber away at your Mac and have it do things, that'd be great from an accessibility and usability standpoint for all users. On an iPad, where the device becomes the app that's being run, skeuomorphic design (in this context, software emulating the visuals and sound of real-world items) is more forgivable, but on the Mac we're not enamoured to see a leather-bound iCal with torn paper nor the disaster that is Address Book. They look out of place; worse, they look dated compared to the sleek, beautifully reworked Mail. Microsoft and Apple have nicked each-other's ideas since GUIs became popular, and we wish someone at Cupertino would be 'inspired by' Windows 7's Snap to. Again, there are lots of third-party tools that enable you to snap a window to half the screen's width, but it'd be great if this functionality was built-in. Full-screen mode is fab on a MacBook Air, but it just doesn't work on an iMac. You end up with apps displaying ridiculously long lines of text or narrow view areas that have acres of space at each side. One solution: more adaptive design that makes better use of widescreen displays, such as Henrik Eneroth's Safari mock-ups. Additionally, let advanced users tile apps in full-screen, so you could, say, have Mail and iCal side-by-side but with no other distractions. The iPhone 4 has spoiled us. After that, every other display looks like it's firing jagged pixels directly into our brains. So the next step for Apple must surely be higher-resolution displays, at which point OS X will need to happily deal, iOS-style, with 'standard' and 'Retina' images ('Retina', in this sense, probably meaning pixel-doubling). Ah, Time Machine. You're great when we want to get all 'Doctor Who' and find a file we stupidly trashed, but you're not so hot when our Mac's hard drive keels over and we need to carry on working. We should be able to start up from a Time Machine back-up and carry on working, like we can when using SuperDuper! and Carbon Copy Cloner. So I download OS X Lion through the Mac App Store, but OS updates then arrive via Software Update? I understand that. My mum won't. Sort it out, Apple. So that's our wish list, but what about the name? And then there's the question of the name—what will the OS X 10.8 name be? Apple's almost out of big cats (and has already used the king), bar ones that would usher in extinction jokes (OS X Sabre Tooth! ), trademark infringement lawsuits (OS X Nyan Cat! OS X Thundercat! OS X Battlecat! ), or just sound a bit rubbish (OS X Tabbycat!). So how about Mac OS X 11.0, based around an entirely new theme, such as space (OS X Comet! OS X Supernova!) or bears? We'd pay good money for OS X Grizzly, although Apple's marketing department might want to skip right past OS X Koala.